NAM has trended snowier on this run. Would drop at least a couple inches across much of north Jersey. Low Level Cold air is draining down from the North, remember all that tall about how cold and snowy Canada is this fall? Guess what it's coming and will be until March. There is a nice 50/50 low with a 1039 HP over NE and the kicker in Great Lakes is peeled back a bit and further west , they always do this. JB saying 6" plus for Apps and 3-6 for piedmont with sloppyness near coast. NAM!! The llc sign is what I am looking at this range. Tomorrow evening track comes into play more since we have this storm to get out of the way first which will help the set up for the snow one. 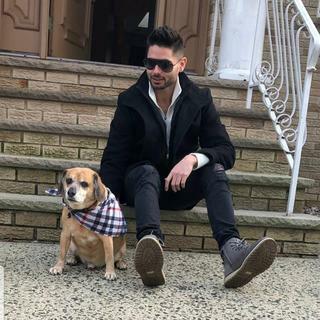 Love it that Frank started this thread this morning and is getting more excited with each post. I'm sure most of you on here think I am absolutely insane for making one this early, but I try to issue my first calls as far out in advance as I feel comfortable with my thoughts, which varies from storm to storm, but is usually two to three days out. That said, they are not just whimsical guesses. I have factored in multiple facets including the pattern around the Northern Hemisphere, influences that exist or might exist closer to home, model biases, model data, and climatology, all blended with my interpretation of the aforementioned factors and how I think they will impact the eventual outcome of our system. In this case, my analysis leads me to believe that we will see this system trend colder and more progressive (further south and east) as we continue to draw closer to the onset, with the corresponding axis of heaviest precipitation shifted further east than current modeling suggests. 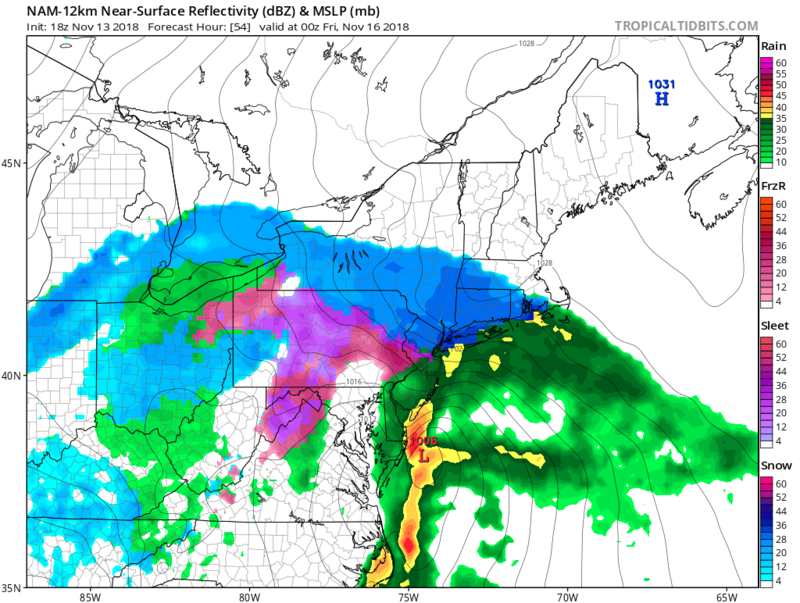 While I do think it will turn out colder than what is currently being modeled, I DO NOT think it will be enough to bring meaningful accumulations to the I-95 corridor and points east. HOWEVER, that DOES NOT mean that those regions will not see any wintry precipitation; I just am not expecting it accumulate at this time. Where this system does remain mostly/all snow, and where the axis of heaviest precipitation sets up, I do think Warning criteria snowfall totals will be met. This system will come in two parts; an initial warm-air advection shield followed by an intense frontogensis band on the backside forced by very strong lower- and mid-level temperature advection. Both rounds of precipitation will likely feature periods of moderate to heavy precipitation, so where it snows, be prepared for lowered visibilities with impressive rates of accumulation. 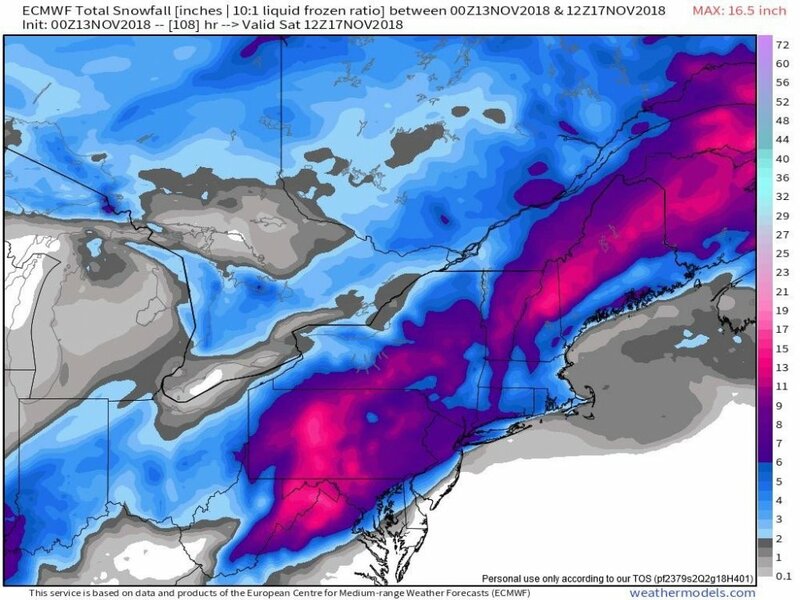 Even though the cross-model mean liquid equivalent ranges from 09-1.7" per 12z guidance, given expected snowfall ratios that will be less than prime, along with warm ground conditions, accumulations will be slower than what might otherwise be expected, and are the reasons why I am not confident in going higher at this time. Other uncertainties, such as those directly related to my assumptions on eventual track (thermal profiles, etc.) are also in the back of my mind, but I feel decently confident in this as of now. Love that we are talking snow again. The oak trees in my area are full of leaves so any snow could lead to power outages. Last nights EURO trended colder. Northern half of Jersey with warning criteria snows. nutleyblizzard wrote: Last nights EURO trended colder. Northern half of Jersey with warning criteria snows. What makes this all the more interesting is that the EURO has a bias for warm thermals. I think everyone would take this in a heartbeat wow. Yes I understand the coast issues but one thing I know this will stick to trees and leaves which we very much still have though they are falling but I think there would still b power outages. We can do without that. 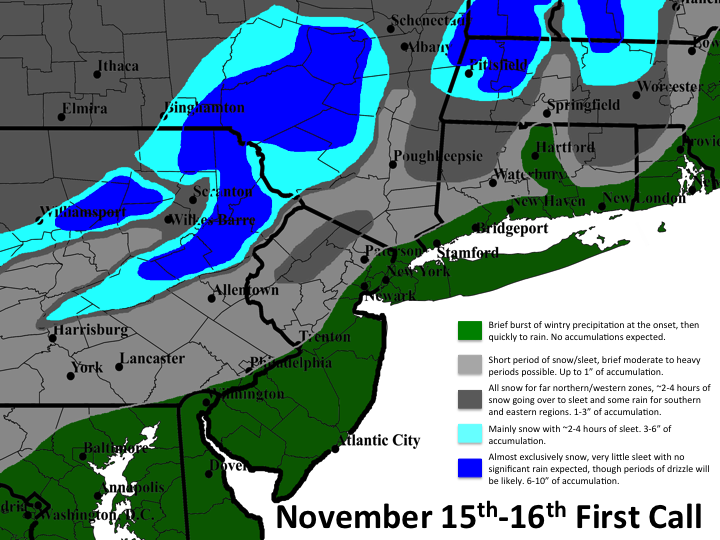 Let this happen verbatim 6 inches of snow NYC area Nov 15th 16th when was last time that happened if this verified? It was only 6 years ago, and it was even ten days earlier than this. On November 6-7, 2012, Central Park recorded 4.7 inches during that post Sandy snow storm, but many areas of the city recorded 8 inches from that storm. I was in Queens the day after and there was at least 8 inches, maybe a little more. NAM shows 1 to 3 inches for areas away from the cities and coast. Less than an inch for cities and coast. Still looks like many are in line to see their first snow of the season Thursday. It is likely to start around 3pm. Not sure I understand what the Euro seems to want to pick up on that the rest are not? Seven inches of snow for my area with this type of setup doesn't make a whole lot of sense to me. Just seems like the warm air aloft should overrun the CAD pretty quickly at onset in my area (Hunterdon County). I think the Euro is vastly overstating the CAD aspect on this one. How much did latest Euro give area? hyde345 wrote: How much did latest Euro give area? Interesting setup. We could even see some flakes here in the city! While I see it changing to rain quickly here, I could see places north and west getting in on some steady snow, sleet, and freezing rain Thursday afternoon into Thursday evening! sounds good to me Wahoo. Do you think school will get out early in white plains? I'm up there now. that's pretty late 7pm no? I thought this starts midday or early afternoon? Euro has most areas seeing 6 to 8 even southern Westchester. This will b wet so with still many leaves and some gusty winds to 30mph looks like we could have problems. » Approaching The Event Horizon’ – Mysterious Deaths Linked To CERN :CERN Collider – The Stargate of Shiva?